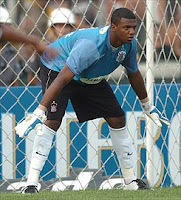 Having suffered the first relegation in the history of the club, Corinthians are now facing the possibility of losing their star player, goalkeeper Felipe. Felipe, 23, put together a string of impressive performances during the campaign and it thought to have attracted the interest of clubs in Spain as well as in his homeland. However, he seems content to stay at Corinthians as long as they can match his increased wage demands. Corinthians have offered him a rise of 80%, but it seems that this will not be enough to appease Felipe and his advisers, who are looking for an even larger increase. "What the club offered is some distance from what we require, but we do not want to attack the club. He [Felipe] is calmer to negotiate based on the most recent offer rather than the original one. It is better now to talk with the staff, who are intelligent. I am confident in arriving at a common denominator."